Analyse the Opening and Ballroom Scenes In the Two Versions of Romeo and Juliet. ANALYSE THE OPENING AND BALLROOM SCENES IN THE TWO VERSIONS OF ROMEO AND JULIET. HOW IS FILM LANGUAGE USED TO CONVEY MEANING? Romeo and Juliet has been made into many plays and a few films. The two films I am going to analyse are Zeffareli's production (1968) and Luhrmann's production (1997). I am focusing on the opening and the ballroom scenes of the films. The directors play a major part in the films. Zeffareli's production is for a more mature audience. He expected his audience to have already read the play and to be familiar with the characters. It is more of a romantic genre because of the music and the way that it is portrayed. In Luhrmann's production however, he clearly introduces the characters and this is more understandable for an audience who have never read or seen Romeo and Juliet before. This version is more of an action / western genre because of the battles being emphasized and the western music at the beginning. How the film language is used makes the production all worth while. ...read more. In this case the voice over would be used more for advertising purposes. To keep an audience interested, a soundtrack is used. In Luhrmann's production we hear helicopters and car horns in the background. We also hear gunshots and the swift actions of the actors were being emphasized and a breezy sound when the fire starts in the petrol station. In Zeffareli's production we hear chattering in the background, horns and bells, horses and mothers screaming with their babies. The differences between the sounds show which the modern production is and which the older production is. The soundtrack conveys meaning by showing that the Capulets and the Montague's aren't just causing havoc between themselves, but also on the whole of the town and the gunshots show that's its violent and other people are going to be hurt, either emotionally or physically. The next most important aspect is the music. In order to create the atmosphere that the director requires, music is used. For example, if the director wants to create a Romantic atmosphere then he would use slow, classical music. ...read more. and have a casual look to them. Costume is used by the director to convey meaning by giving us an overview of the situation and how both sides (the Montague's and the Capulet's) are so different. Camera angles make the film either interesting or a complete failure. In Luhrmann's and Zeffareli's case, they have made it very interesting .In Luhrmann's production, the fast shots contrast with the freeze frames to show tension in the atmosphere. And there are lots of birds eye views of the action at the garage. Also there are major close up shots to show the fear in the actors eyes. This is more effective the having a far shot. In Zeffareli's version, there are big close ups and medium close ups where action is involved. There are long shots to show the extent of the damage done on the village during the battle and there are plenty of shots in which a moving actor walks into the space. Baz Luhrmann uses the camera angles to convey meaning by giving it a hidden meaning, Whilst the shots are moving and giving you fascinating views of the characters, it is making you want to keep watching it and explore the differences in the characters. ...read more. There are two lights, which are both pointing at Tommy and Emma. Scene 4 This was the final scene, where Goblin, Jack, Jimmy, and Tommy all fight. This was a very powerful scene, which took a long period of rehearsals to get it just right. This also meant that Romeo wouldn't be able to se his love Juliet... Romeo then tries to kill himself. Romeo should go see Juliet and then leave for Mantua, the next town. Romeo then visits his new wife. However, another problem soon comes up. 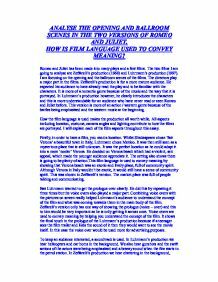 Critically analyse the opening extract of Baz Luhrmann's Romeo and Juliet. Luhrmann deepens this effect by choosing that they drive an open top bright yellow car. The third mise en scene is when the Montagues are getting their petrol; the Capulets arrive at the petrol station. The audience, don't see the Capulets faces till they come out of the car, feet and legs first. When we first meet Lord Farquaad and the hooded figure, there is a marching music, which suggests a tense battle like environment. Also upon Shrek's entrance to the arena, there is an organ music, which suggests an importance of Shrek's tournament and the importance of the Lord. off at the end of the lines, repeating them quietly discordantly in accordance with the stage direction: [Repeat as voices echo in the distance]. The costume of the chorus at this point would be police uniforms and dark sunglasses to prevent eye contact, thus making K feel uneasier. a 'Los Angeles City' feel by the set being called 'Verona Beach' as this will appeal to a modern audience. The prologue uses a variety of images, for example, the voiceover gives auditory images unlike the print on screen which gives a visual image. Luhrmann has just used one object such as a statue to mean more than one thing he has been successful in picking what kind of object to put in the beginning of the film to give the audience ideas on what happens later in the film. We played with pacing to see if the audience would respond better to an increase in speed. Once decided , we invited a focus group to watch two trial clips with two different types of pacing. With a unanimous decision it was decided that the one with greater speed added a more conventionally dramatic feel to the psychological genre.